Avalon. They are also featured on this site. bar, terrace off the Master suite and many other fine amenities. 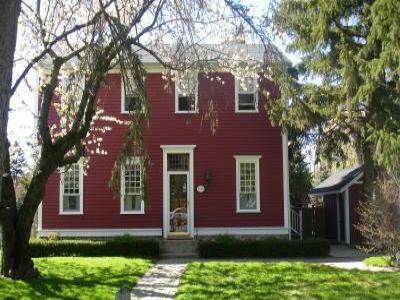 house, full of character and completely equipped with all amenities. bedroom and ensuite 2 piece bath. doors and transom lights above the leaded glass front door. other bedrooms are located and two bathrooms. in this bedroom as well. The second bedroom has a queen size sleigh bed and antique pieces. white iron single day bed. The two windows bring in a lot of light. table seats up to 10 people. It is very private. horse and buggy rides through town. $295 CAD per night, min. 2 nights. $475 CAD per night, min. 2 nights. $595 CAD per night, min. 3 nights. allowed at the home at any time is 10. Please email us for reservation requests or any questions. Remaining balance due 30 days prior to arrival.